Kim Kardashian announced on Thursday that herself and two sisters, Kourtney and Khloé, would be winding down operations of their DASH women's boutiques. The company's two stores in Los Angeles and Miami will reportedly close on 1 June. DASH has not yet confirmed whether its online store will also close. The retail apocalypse is coming after the Kardashian family. On Thursday, Kim Kardashian-West announced on her website that she and her two sisters, Kourtney and Khloé, would be winding down operations of their DASH women's boutiques, which sell a mix of high-end brands and the company's own label collection. "We've loved running DASH, but in the last few years, we've all grown so much individually. We've been busy running our own brands, as well as being moms and balancing work with our families. We know in our hearts that it's time to move on," Kim Kardashian wrote on her website. DASH did not immediately respond to Business Insider's request for comment and has not yet confirmed whether its online store will be closing. The three sisters opened their first store in Calabasas, California in 2006. It grew to have three locations in Los Angeles, Miami, and New York; the latter closed in 2016. Kim Kardashian described the news as "bittersweet." Its website has not yet been updated and still states that there are "talks of major US and international expansion to follow." UK newspaper, Metro, confirmed that the two DASH stores will open for the last time on 31 May. In the past, it has been reported that the three sisters struggled with the store. 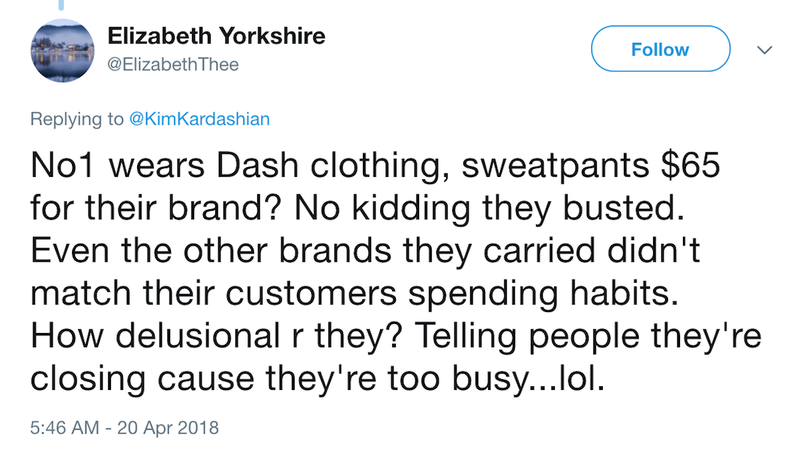 In a blog post written by Khloé Kardashian in 2016, she wrote: “We started DASH in 2006 and really struggled for a long time to make it a successful business—there were months we couldn’t pay our bills, and the store didn’t turn a profit for years." Its own brand collection costs from $40 for a plain T-shirt up to $65 for a sweatshirt with the DASH logo on it. Some of the pricer designers on its site are selling swimwear for as much as $576. "I've never seen anyone on the face of this earth wear DASH," one Twitter user wrote.